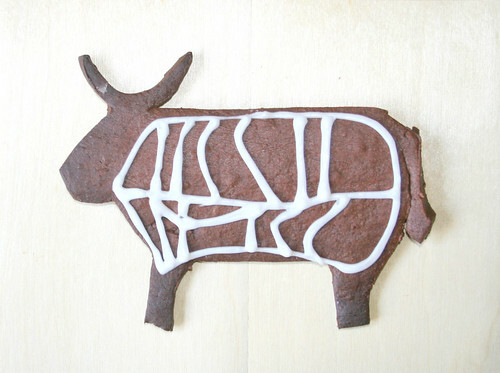 Cow butchery diagram, rendering in frosting on a chocolate cut out cookie. I whipped up these cookies this week, using a Martha recipe. Of course she didn't suggest the quadruped shapes, but the cookies are delicious. Since I don't have snazzy animal-shaped cookie cutters, I made my own cardboard templates, and used a knife to cut out the little critters.